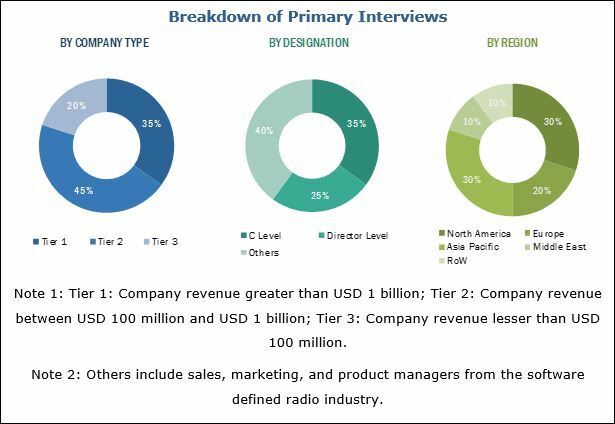 [215 Pages Report] The software defined radio market was valued at USD 18.26 Billion in 2016 and is projected to reach USD 30.00 Billion by 2022, at a CAGR of 8.63% from 2017 to 2022. The objectives of this study are to analyze the software defined radio market along with the statistics from 2017 to 2022 as well as to define, describe, and forecast the software defined radio market on the basis of application, component, platform, frequency band, and region. The base year considered for the market study is 2016, whereas the forecast period is from 2017 to 2022. The software defined radio ecosystem comprises communication equipment device providers, such as Northrop Grumman (US), BAE Systems (UK), Harris Corporation (US), Rockwell Collins (US), Thales (France), General Dynamics (US), ASELSAN (Turkey), Rohde & Schwarz (Germany), Leonardo (Italy), and Elbit Systems (Israel). Some of the major commercial players include ZTE Corporation (China), Huawei (China), and National Instruments (US). They also provide a broad range of management, engineering, technical, communications, and information services. The software defined radio market is estimated to be USD 19.83 Billion in 2017 and is projected to reach USD 30.00 Billion by 2022, at a CAGR of 8.63% from 2017 to 2022. Software defined radios are increasingly used by the military to improve the command and control of troops stationed on the battlefield, as well as to enhance situational awareness of the battlefield. On the basis of application, the software defined radio market has been segmented into defense and commercial. The commercial application segment is projected to grow at a higher CAGR than the defense segment during the forecast period, primarily driven by the growth of the telecommunication and transportation sectors. Software defined radios used in these sectors are upgradable, which is essential due to the adoption of new and emerging communication technologies, such as 4G and 5G, among others. On the basis of component, the software defined radio market has been segmented into software, transmitter, receiver, and auxiliary system. The software segment is projected to grow at the highest CAGR during the forecast period owing to the increasing use in commercial systems which are easily upgraded by software to increase their compatibility with new communication standards and military waveforms. On the basis of platform, the software defined radio market has been segmented into land, airborne, naval, and space. The space segment is projected to witness the highest CAGR during the forecast period owing to the increased use of software defined radios in satellites and launch vehicles. On the basis of frequency band, the software defined radio market has been segmented into VHF, UHF, HF, and other bands. VHF is projected to be the largest frequency band segment in the software defined radio market during the forecast period owing to the high usage of the VHF band in military communications. The software defined radio market in the Asia Pacific region is expected to witness the highest growth rate during the forecast period from 2017 to 2022. Countries in this region have been increasing their defense spending and are focusing toward strengthening their communication capabilities by procuring advanced communication systems. This poses a huge market opportunity for communication systems manufacturers. 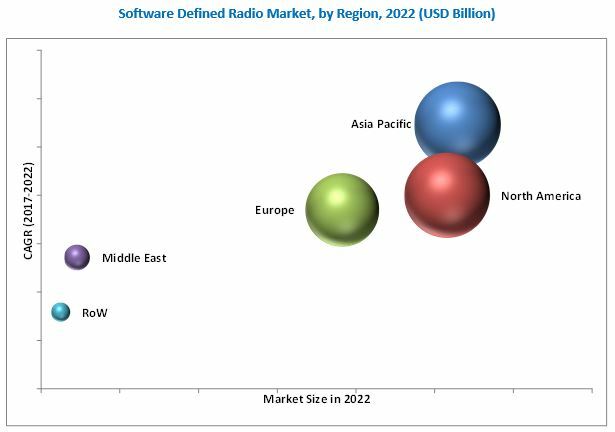 Restraining factors for the growth of the software defined radio market include issues related to ensuring seamless connectivity in a limited bandwidth. Several major defense players are present in the software defined radio market. Some of these players include Northrop Grumman (US), BAE Systems (UK), Harris Corporation (US), Thales (France), General Dynamics (US), Rockwell Collins (US), Leonardo (Italy), ASELSAN (Turkey), and Elbit Systems (Israel). Other commercial players include ZTE Corporation (China), Huawei (China), and National Instruments (US). Harris Corporation is one of the top companies profiled in the software defined radio market report. The company focuses on securing government contracts to achieve growth in the market and is the major provider of software defined radios for the US armed forces. The company has a diverse product portfolio and vastly invests in research and development.